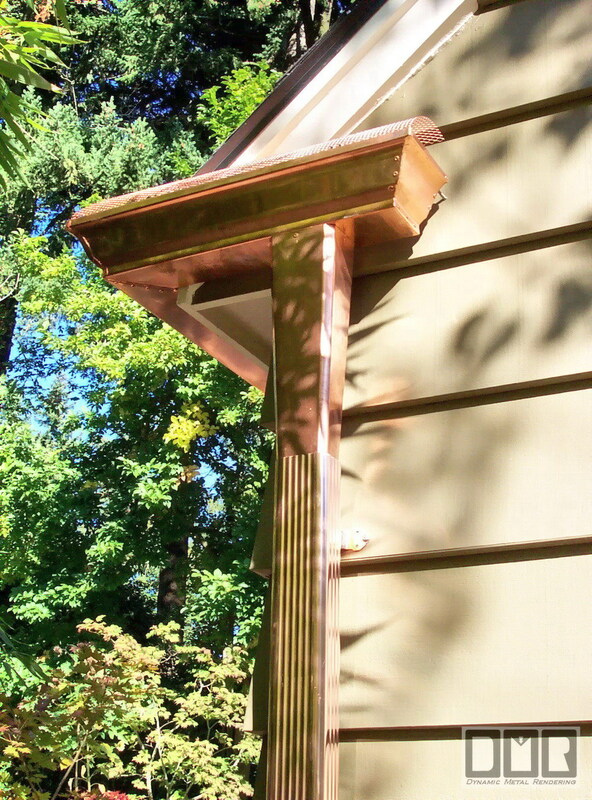 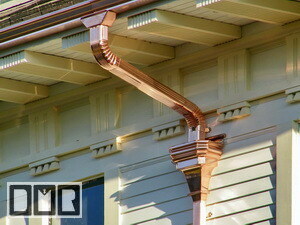 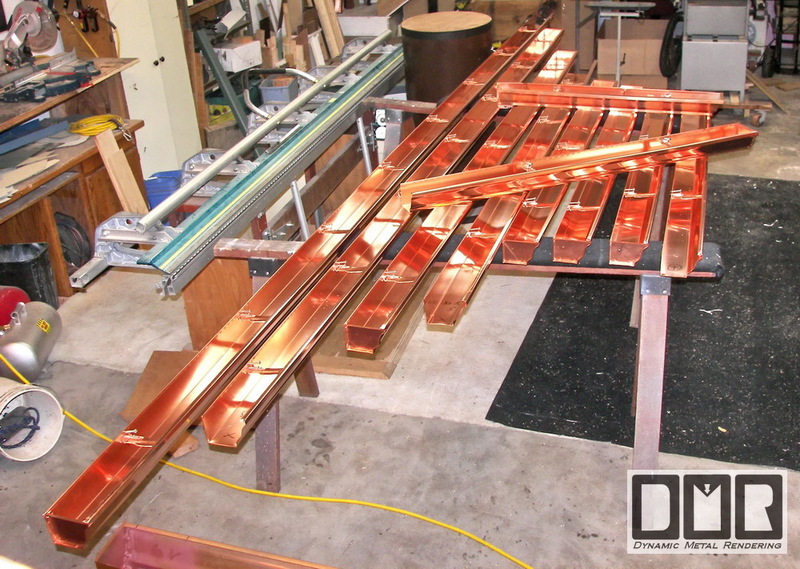 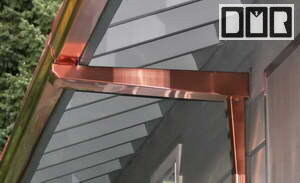 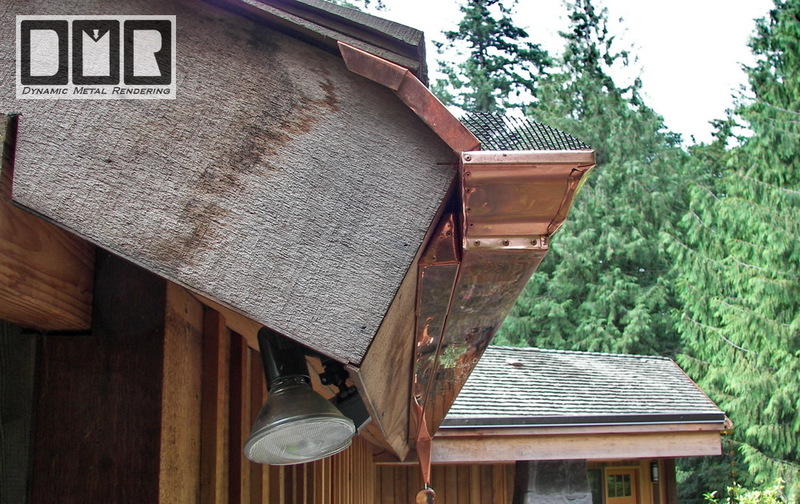 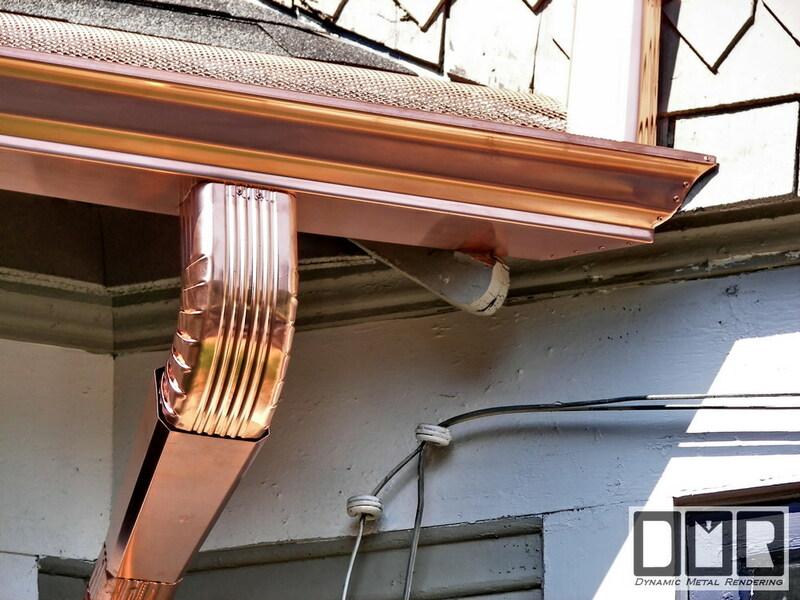 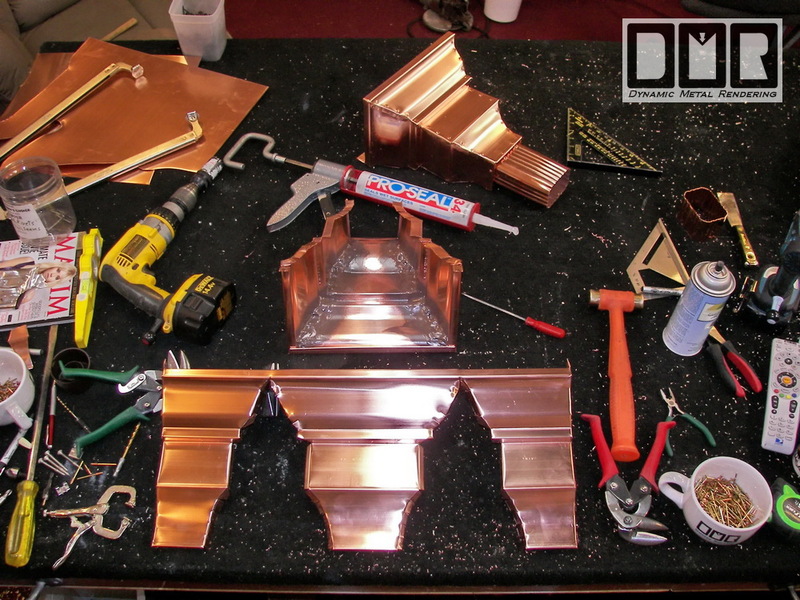 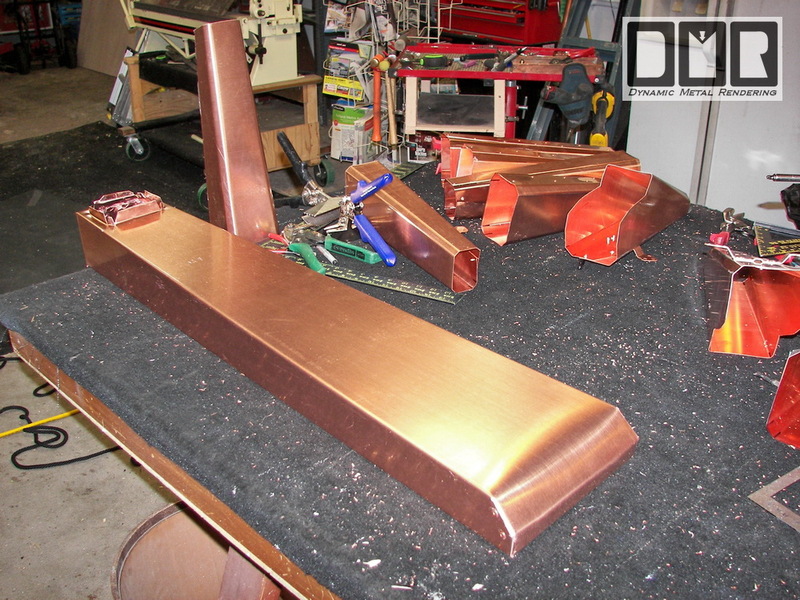 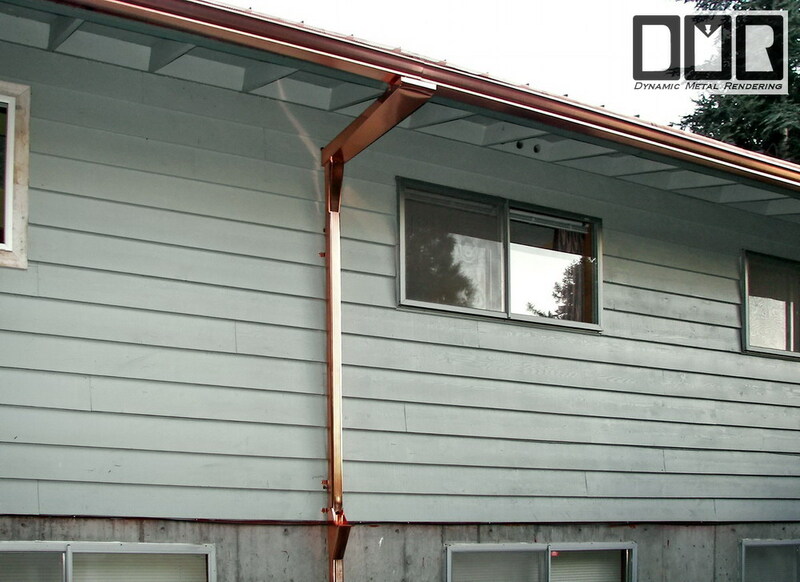 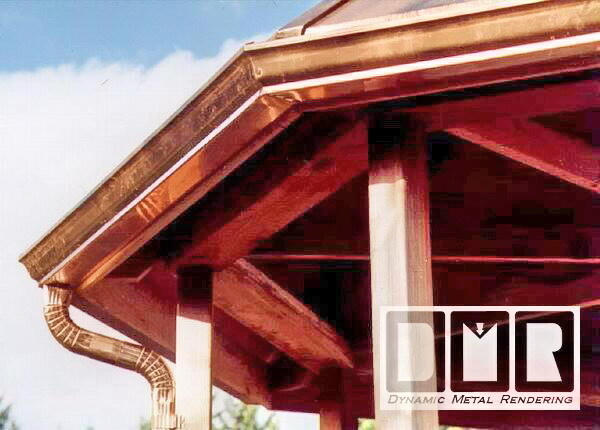 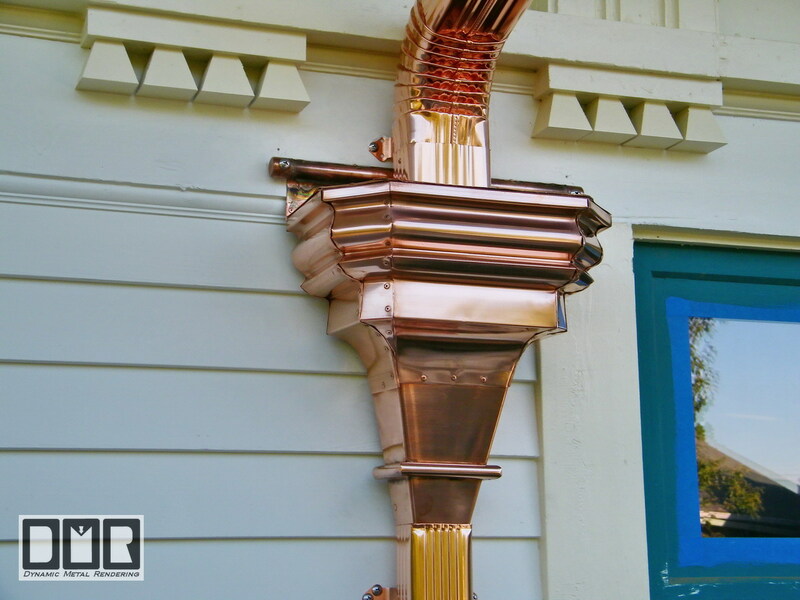 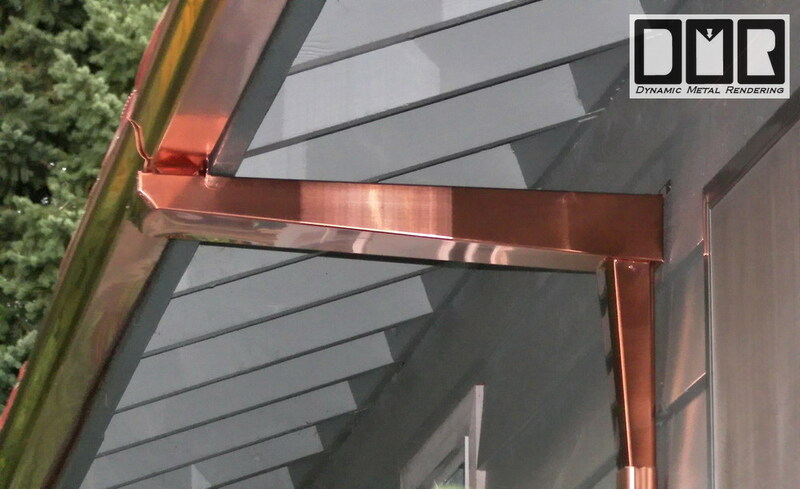 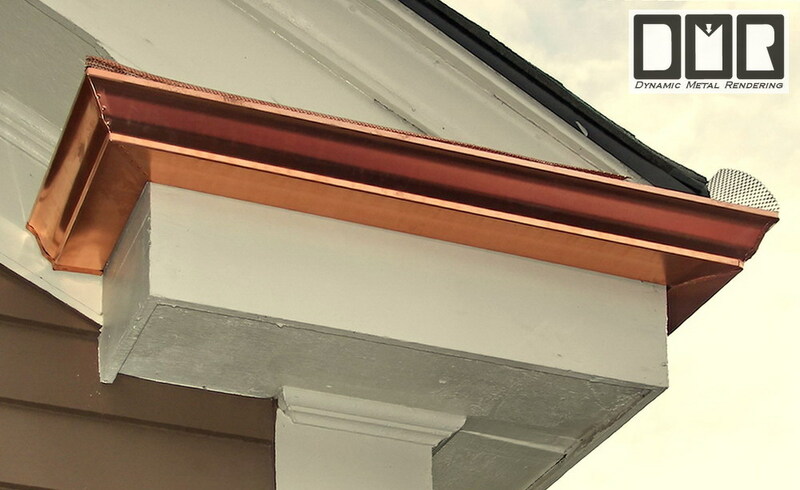 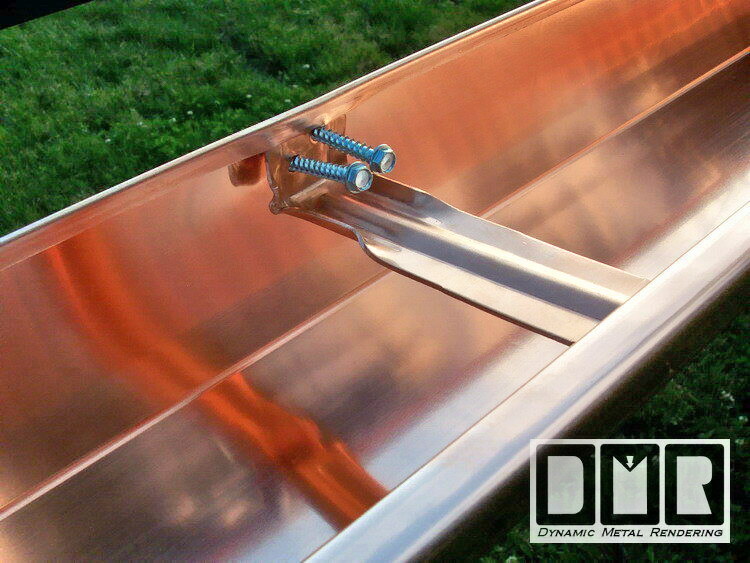 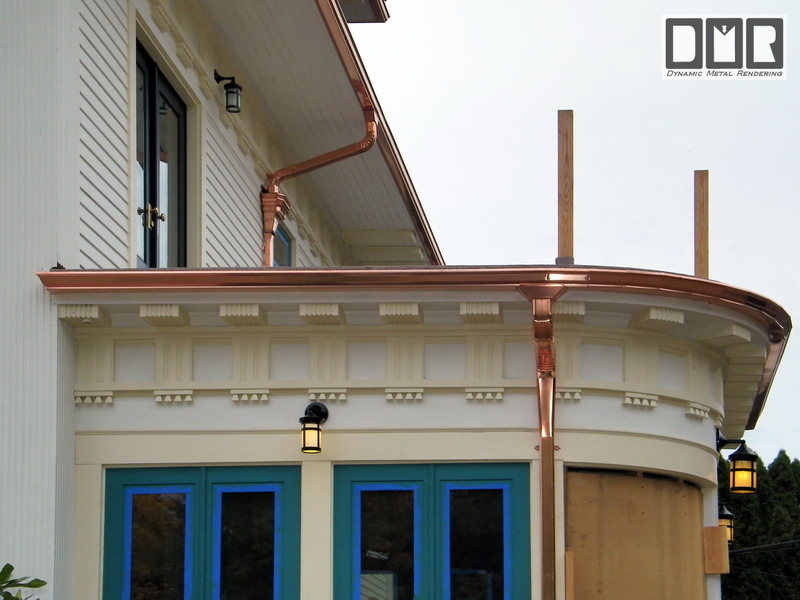 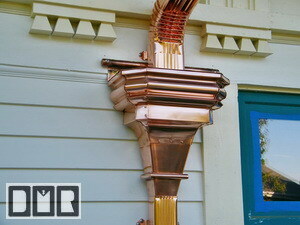 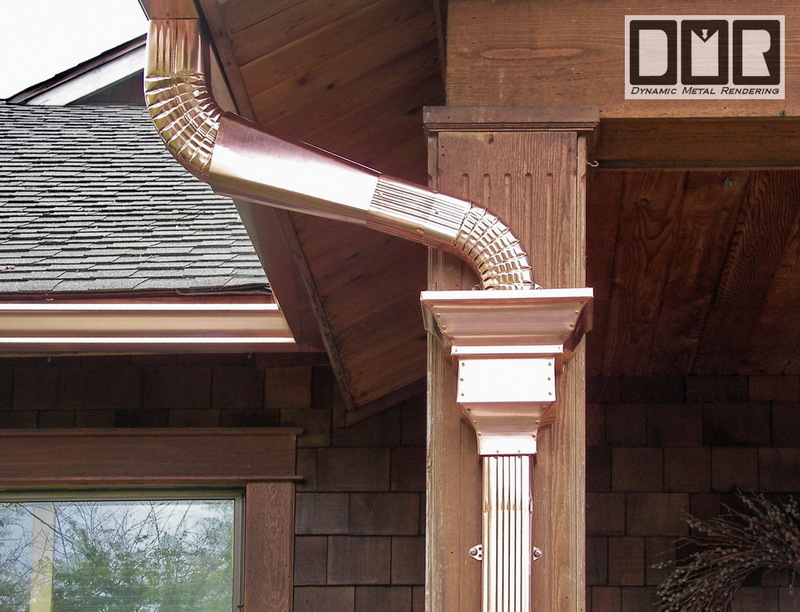 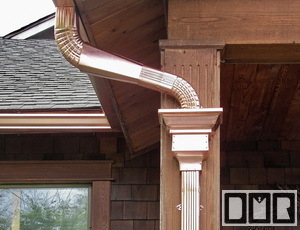 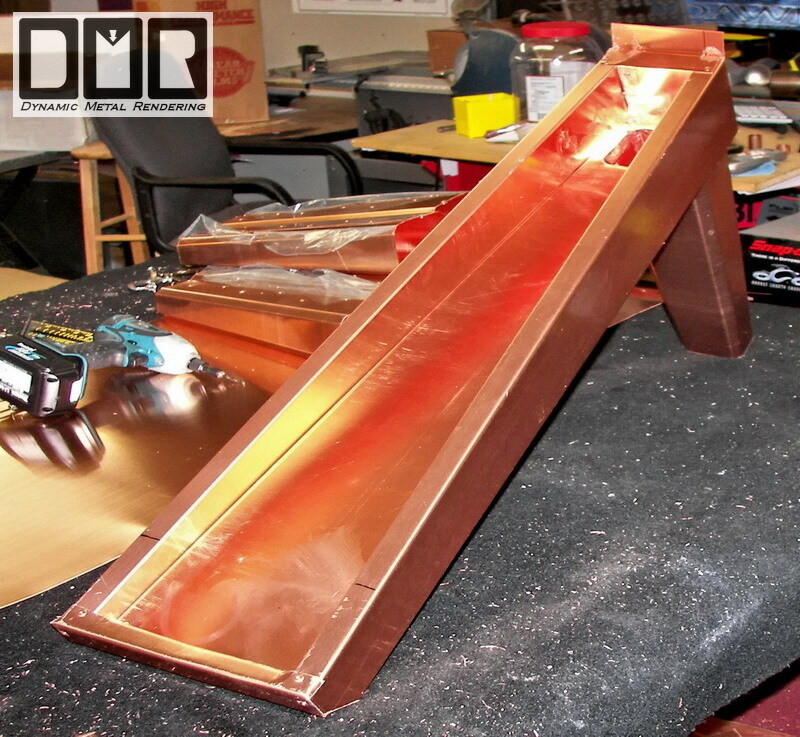 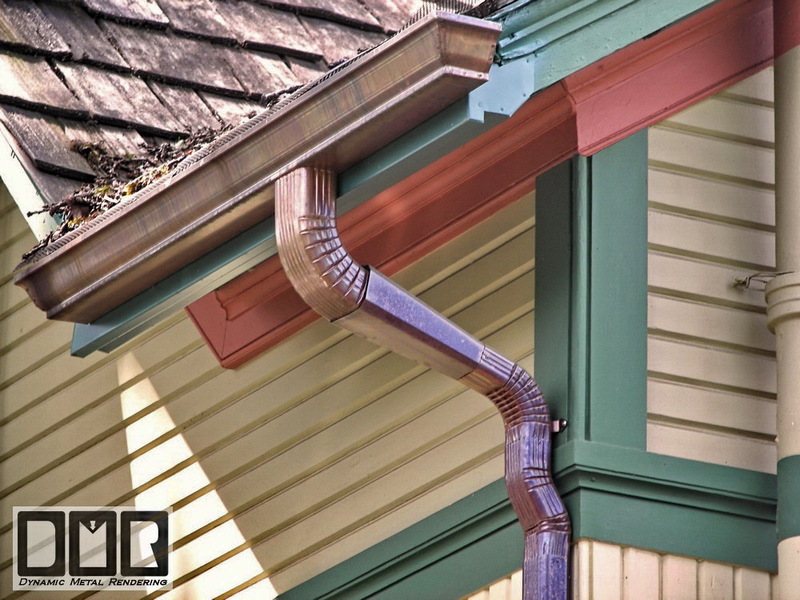 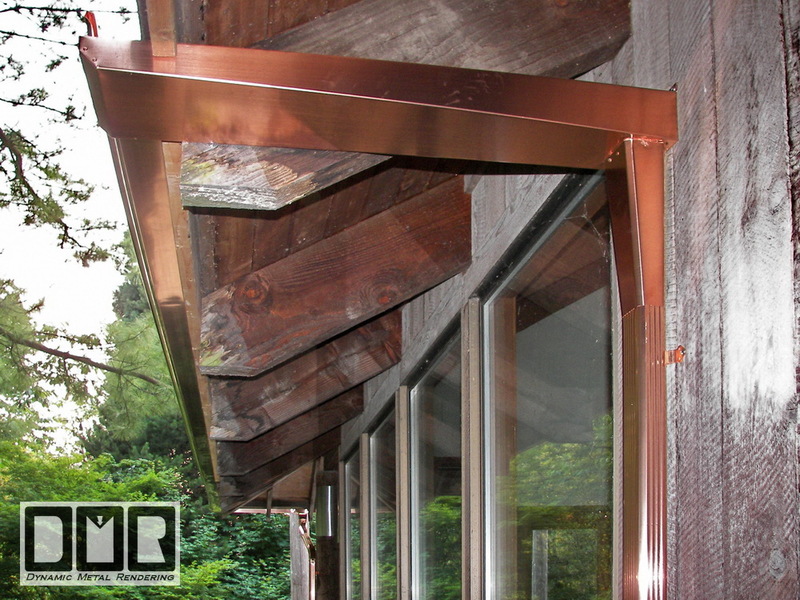 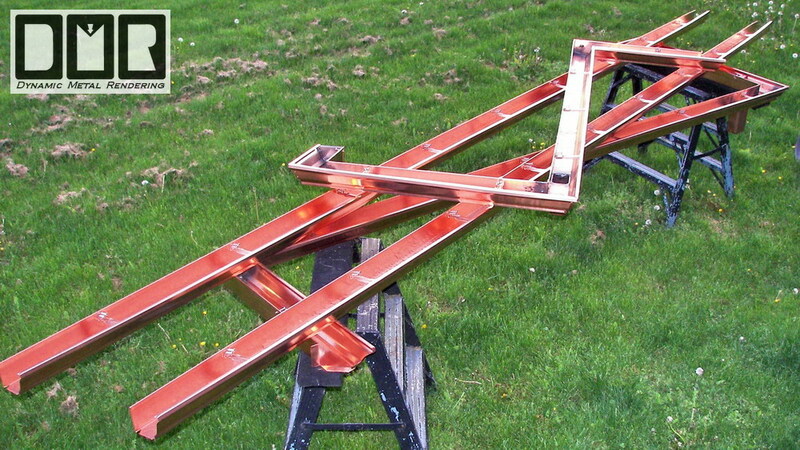 Here's a few photos of some of the custom copper gutter work I have done to show you the capability I have to solve the design issues you might have. 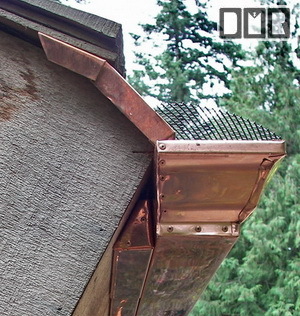 Several of these shots show the copper screens over the gutters, but they are expensive and fragile, so I have since found a better screen product that is a thicker and heavier metal and is pre-painted in a black powder bake finish over steel, so it is a lot less conspicuous looking and much less expensive. 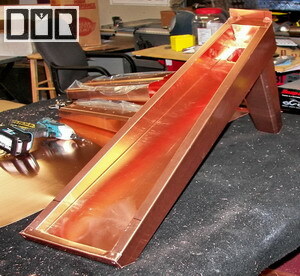 It also comes in wider 4' sections, so there are fewer gaps. 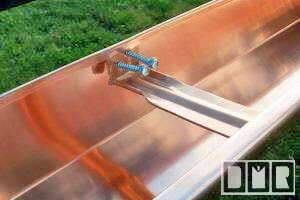 It also comes with three hinge clips per screen, instead of only two. 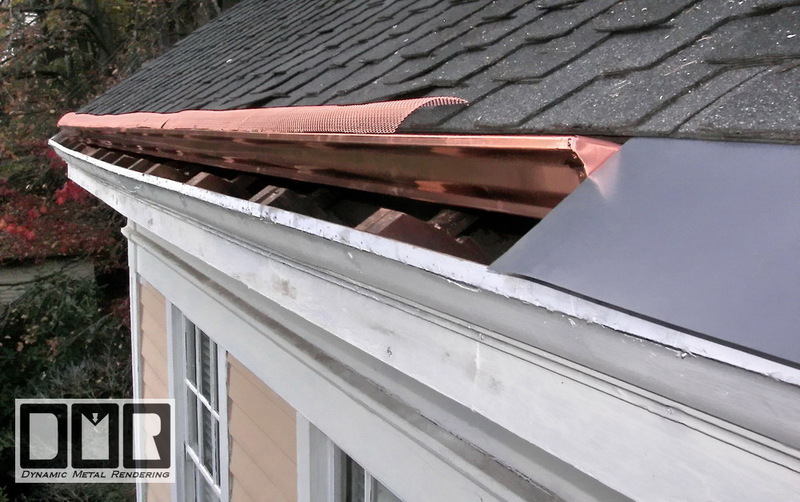 The shot below left shows the custom trays I make to channel the filthy gunk from and upper gutter down to a lower gutter over the roofing, so it does not wear the roofing shingles and cause a nasty moss trail. 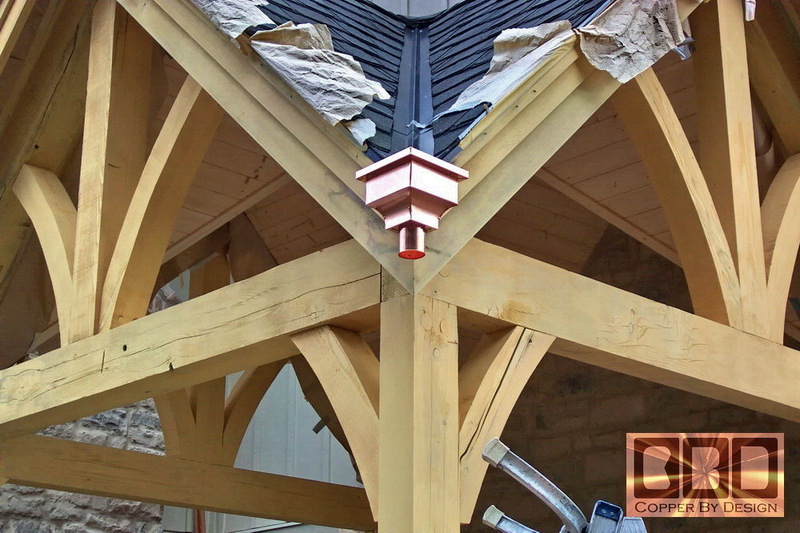 The other shot below right shows the custom end cap to match the siding angle to the end of the gutter. 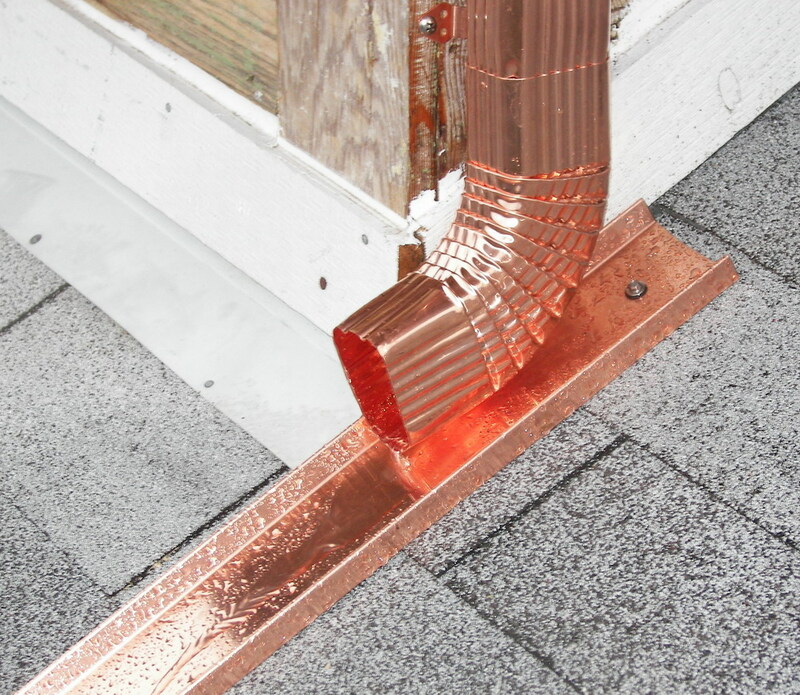 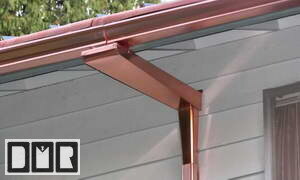 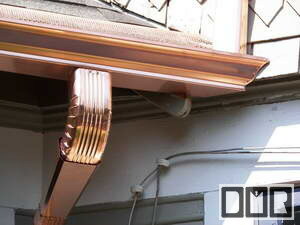 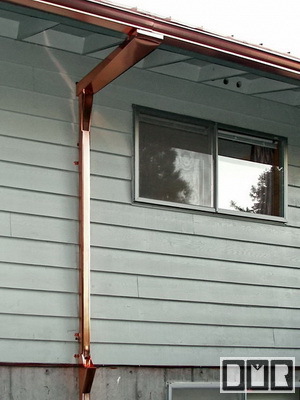 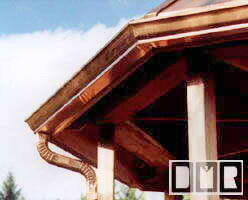 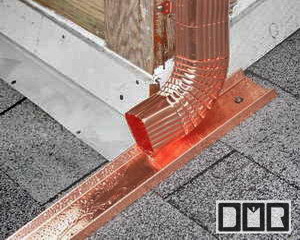 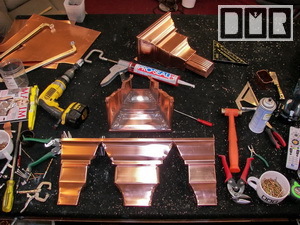 The shot below left shows the 4 part copper gutter resting on top of some other copper gutters that has been formed and the 90 degree corners seals with the outlet punched and a short section of larger 3x4 downspout already attached and sealed to the bottom of this gutter with all the hidden hangers in place and the stainless steel screws started before the actual installation. 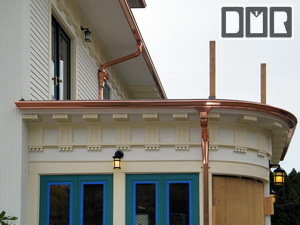 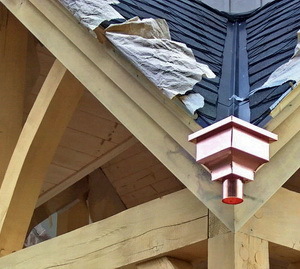 The next shot shows that copper gutter on top installed. 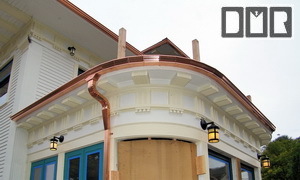 The shot below left shows some of the different elbows I use for a more custom fit to the shape of your house where needed. The right photo below shows a built-in gutter that I replaced with a copper gutter and then flashed across the wood in front of that gutter to cover the rest of the woodwork in order to replace the old steel gutter that was there and leaking causing damage. 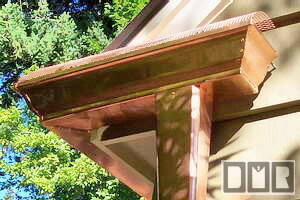 The shot below left shows the custom wedge I made to support the gutter on this diagonal fascia board and the 9" wide drip edge flashing to cover the old built-in gutter that had been causing so much trouble. 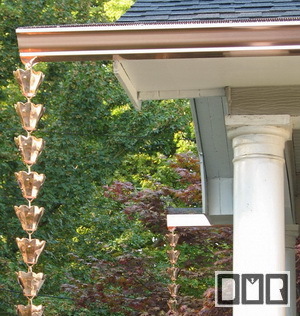 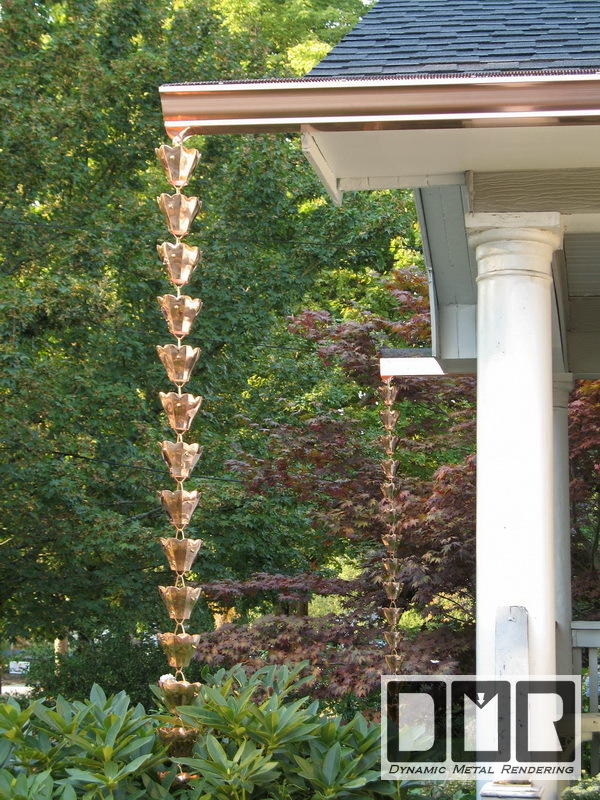 The next photo on the right shows some copper rain-cups in stead of the normal downspout that were mounted on these nice round columns. 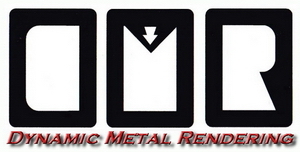 Which do you think would look better? 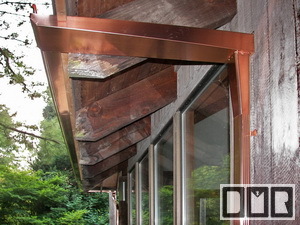 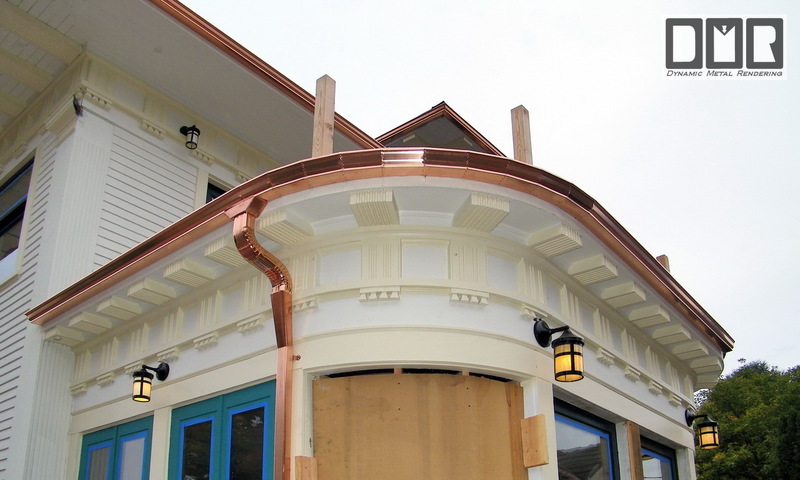 The back balcony on Tara North had a curved design as you see here and I needed to cut 20 pieces of copper gutter 9" long to form this curve for both sides connecting the side and end gutters together. 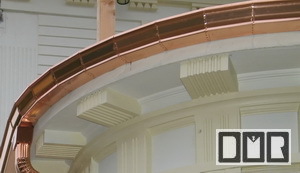 There are 15 rivets holding each seam together. 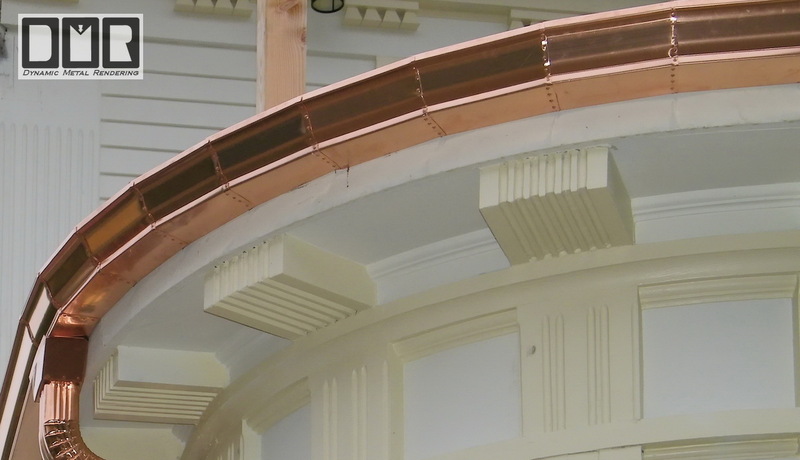 That's over 300 copper rivets just in that part of this project. 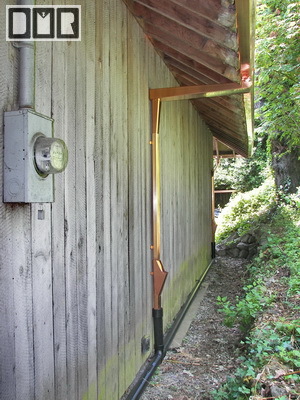 Here is a few close-upshots of the 14" wide Scuppers and 10" wide Super Outlets mounted on Tare North. 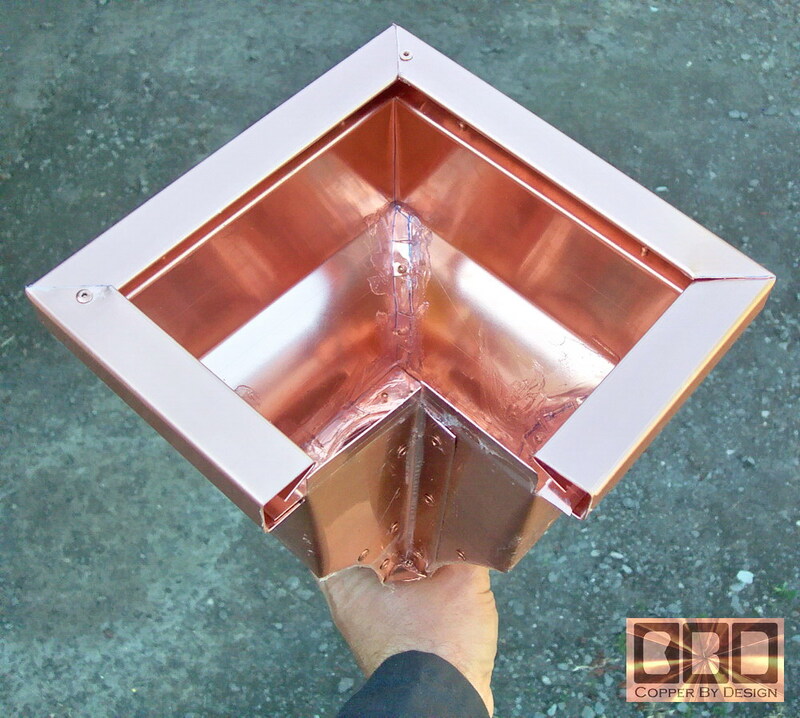 This is a custom copper catcher basin to catch the rain water from a narrow valley. 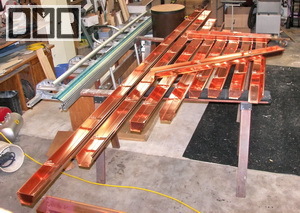 It was made with 20oz copper with each end mitered together. This one was small at only 9" wide. 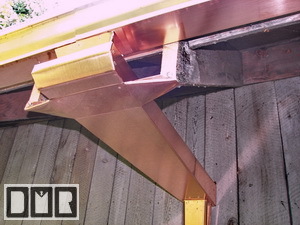 I implement an expansion joint in the middle of long gutter runs to relieve the tension of the difference in expansion and contraction between the copper and the wood structure. 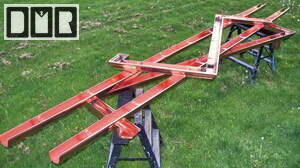 I made this custom tray that the gutters dump into. 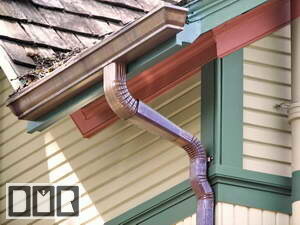 These are also for areas with very little headroom for a set of standard elbows.